Immunet is a cloud based antivirus that also integrates ClamAV to their program for offline scanning. 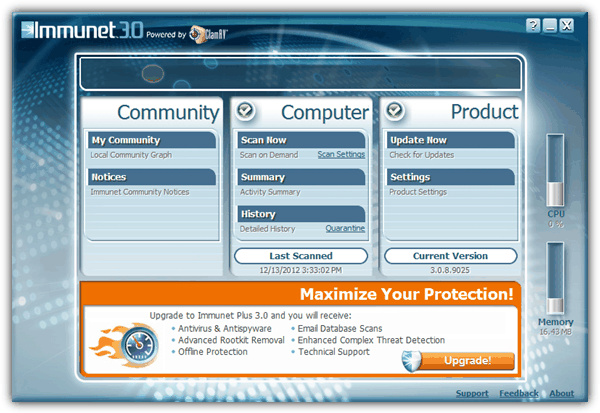 The free version of Immunet has real time protection that only works if the computer is connected to the Internet. However the offline scanning can be enabled by turning on ClamAV engine from the settings. If you are a plus user, the TETRA engine which is actually a Bitdefender engine can be enabled for offline scanning. The good thing about Immunet is you can run it along with other antivirus without conflicts. ZenOK is actually a software to backup your important files and it comes with a free antivirus powered by Bitdefender’s engine to make sure that your files are safe in the first place. ZenOK requires you to sign up for a free account before you can start using it. 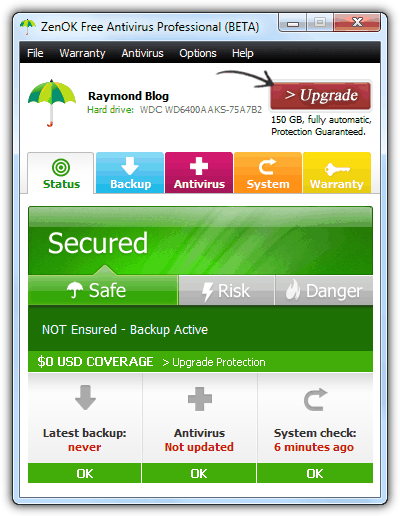 The free account gives you antivirus and 2GB online backup space. After installing ZenOK, it will automatically run an update check to download the latest virus signature file but without showing you the progress. The first time update failed during our test and there is no way to force check an update. 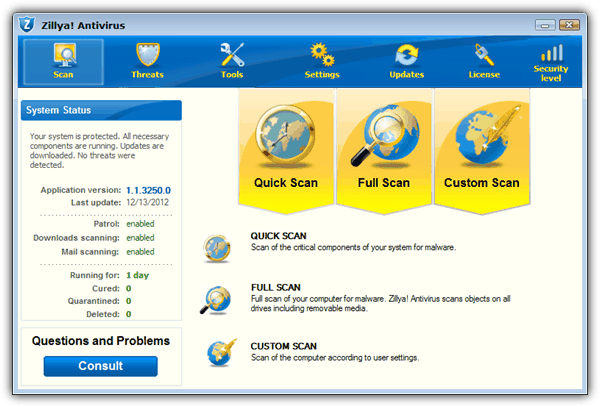 ZenOK comes in two versions which is with and without the antivirus. Make sure you download the ZenOK installer with antivirus or else it is only an online backup with alert system. Zillya! Antivirus from Ukraine is another new brand on the antivirus market that uses their in-house engine. As you can expect, a new engine will most of the time lack of good detection on older viruses. Its real time protection is called Patrol and is enabled by default. Zillya! Antivirus is also capable of scanning both incoming and outgoing emails from your email client software. They guarantee to protect against USB viruses with their unique USB protection module that is able to identify potentially dangerous objects. The free version of Zillya! Antivirus is hard coded to check for updates once in every 3 hours. Celframe is a new security company that started last year by the billionaire Arun Pudur from India. 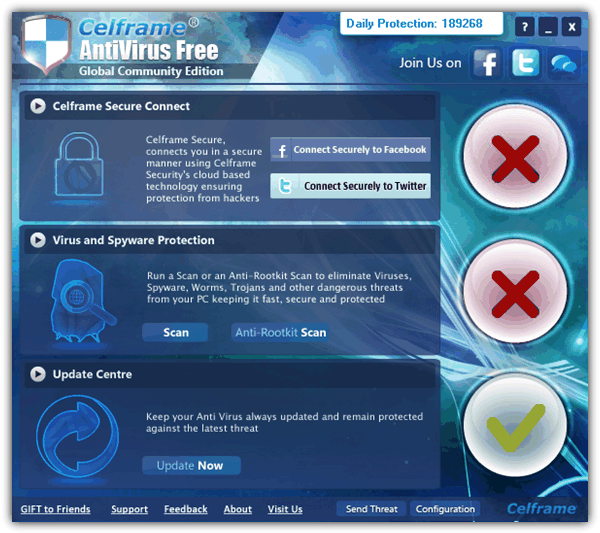 It is claimed that Celframe Antivirus has two scanning methods which is the cloud and traditional signature. Although they are very secretive about the engines being used, they are using ClamAV’s definition and the cloud technology seems to be taken from Immunet. Other than virus protection, it can also scan for rootkit. It comes with a scheduler, email scanning and the ability to extract attachments and macros from Office documents. Do note that the Celframe real time community guard is not enabled after installation. You will need to run at least a full update once and restart your computer, then the option will automatically turned on. 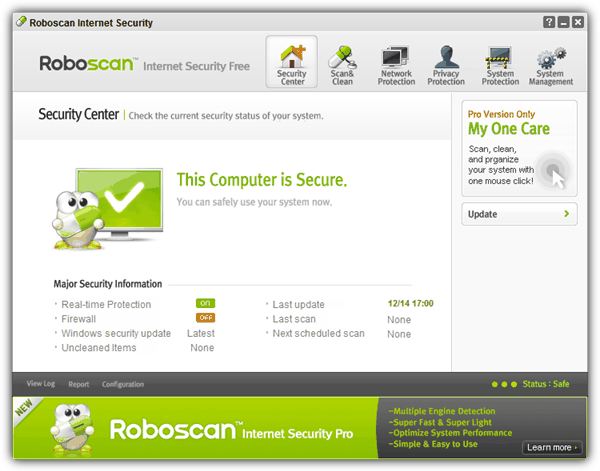 Roboscan Internet Security is a free antivirus program offered by ESTsoft, the same maker of the popular archive software ALZip from ALTools. Although Roboscan’s website did not say anything about ALTools, but the program icon gave them away because the egg-themed icon resembles the one being used in most ALTools software. The only difference between the free and pro version of Roboscan is the advertisement and PC optimization. Other than that, both comes with real time protection from two engines by Bitdefender and their in-house engine called Tera, firewall, and a file shredding tool to permanently wipe the file from your computer to prevent from recovery. Roboscan’s memory usage is low and seems to have a lot of potential other than the minor typo that we spotted at the Security Center (prganize = organize). So far they only had 2 tests on VB100 with 1 pass and 1 fail because of wildlist misses. This would logically mean that they’re using an older engine of Bitdefender because Bitdefender themselves passed the test. Returnil System Safe is actually a free virtualization software that allows you to run Windows in virtual mode so that you can restore back to the exact previous state with a reboot. This is very useful to prevent changes on public shared computers and also to run any suspicious files. They’ve also integrated a basic real time protection from F-Prot antivirus engine complimenting their machine learning engine in the Virus Guard. You won’t find a lot of settings and options for the Virus Guard module other than running a quick or full scan, turning on or off the real time protection, enabling advanced behavior analysis, and automatically rescan when definitions are updated. 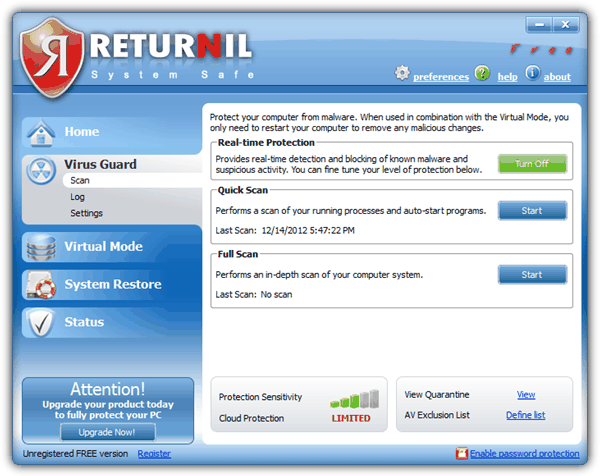 The Virus Guard on Returnil System Safe is a very basic antivirus module. Using a virtualization software would be able to keep your computer safe and clean most if not all of the time and the built-in antivirus adds very little value to it. Moreover, it is not possible to scan single or custom files from Returnil System Safe. At the time of writing, Returnil’s website is currently being suspended and the definitions update process will fail until their server comes back online. Another issue is their current release is still at version 2011 while most of the security applications especially antivirus has updated to 2013. Bitdefender has always provided a free edition but the previous version uses the old 2009 engine and the latest version now is running the current virus detection technologies that can even run on Windows 8. The Bitdefender Antivirus free edition comes with real time scanning that is called Virus Shield and an auto scan mode that periodically checks your system. Game mode is fully automated and will be enabled when it detects a full screen game running. This antivirus is made to be as simple as possible because you won’t find any more setting options other than a few buttons to enable or disable the virus shield and auto scan. To scan the whole drive, you will have to right click on the drive letter from Explorer and select “Scan with Bitdefender”. The first time update takes quite long to complete and it doesn’t show you the progress of the update or an estimated time remaining. After much experimentation with a variety of security offerings, I’ve come back to the much maligned Microsoft Security Essentials, augmented by regular scans with Malwarebytes and Superantispyware. Unsurprisingly, I have no problems to report. I use the same philosophy as I do when driving: Stay away from dubious detours and soft shoulders. We’re the developers of Clearsight Antivirus and would like to inform you that we’re back again with another great news – Clearsight Antivirus’ essential antivirus is free for both home and business customers! We also like to update you that our antivirus is using Sophos AV engine. The users of our Premium version can take advantage of Emsisoft’s Anti-Malware engine as well! I would also love a summary. hi raymond thanks for the info. about all anti virus,but can u also inform us about internet security. I have used Avast Antivirus Pro, Version 5, 7 and 7 in the last 4 years and i have been very satisfied with these products. But after the update to version 8 i’m thinking about to change to another product. I got so many trouble with my computer, that i have reinstalled the old version 7, which license is valid until Juli this year. Another thing is that i don’t want to use cloud based products, because i think, i got tracked by the Antivirus software and i don’t want to know them, which pages i’m visiting. Me too used avast free antivirus edition for 2 years…….. but avast 8 doesn’t seems to be great …. If what Carbonize says is true – that Bitdefender deletes any file it thinks is a virus without asking and without recourse – then Bitdefender is a no-brainer NOT-ON-MY-COMPUTER download. That is totally untenable and the programmers should be violated. The very idea that an app that is well known to produce false positives be given free reign to delete possible critical files and potentially destroy and corrupt one’s system bespeaks of utmost arrogance and stupidity. That behavior needs to be verified and highlighted in the review. Anything less is irresponsible and borders on malfeasance. Yes it is true, BitDefender will delete the file without asking, also it lacks of any setting to prevent this behavior. I contacted them about this and their response was that this was due to a faulty scan by the free version of the product. Does make you wonder what other problems the free version may have then. OK had a better look and it basically does a quick scan every time you tell it to scan a file and the 41 ‘infected’ files were tracking cookies from Internet Explorer. OK so I switched from MSE to Bitdefender because Bitdefender has the better engine. But Bitdefender’s lack of options is frustrating. Dates are all shown in US format of mm/dd/yy and you have no option to specify folders/processes to ignore. More importantly if it finds a file it thinks is malicious during a scan it deletes it without making a backup in quarantine and having no options you cannot change this behaviour. Hi Carbonize………..the newest Bitdefender Free version does an effective quarantine when it finds malicious malware and will also allow you to keep it in quarantine or to delete it permanently plus it gives you the option to allow it back in your system if you should determine that it is a false positive! I been using it for over a month and it’s been working flawlessly. It is also extremely light in using your resources and never interfered with my gaming or other tasks!! GREAT Product!!!! you have left out an important player infact a new comer into the Free A.V Market….Bit defender has launched its free version with its real time protection etc….. 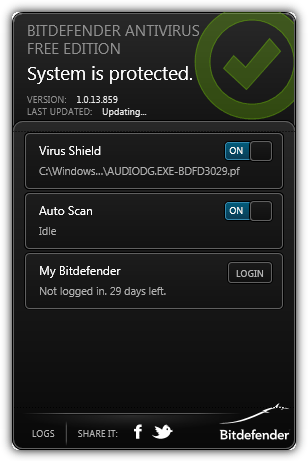 Thanks for notifying me about the newly launched free version of Bitdefender. I’ve updated the article to include it. As always ,you have help me getting through some of the daily problems ,much appreciated all your and your associates hardwork to keep this site running. Nice list! There are some free products I didn’t know about. Thank you! The information about ZoneAlarm having the antivirus engine by Kaspersky is very useful information but I would like to ask if you know what version of the Kaspersky AV it has. Hi Craig. I’ve done some comparison on the files and believe that ZoneAlarm is using the latest Kaspersky engine that is the same with Kaspersky Antivirus 2013. And what is your oppinion? Can ZoneAlarm Free Antivirus + Firewall as efficient as KIS 2013? There’s a difference between using the same engine and having the same effectiveness because how the engine is implemented makes a big difference; that’s why the same engine in different products has different rates of detection. Who uses what isn’t as important as what the test result show. Personally, I’d go with BitDefender; it gives awesome protection with almost no impact on the system. Avast would be my second choice. Chapeau! Looking forward to see your test results about detection. Thanks, Raymond. I like avast! Free Antivirus. Avast Free seems to do all I need-brill-but I have recently had a prob with their WebRep part which crashes when using Chrome 23.0.1271.97 m. Easily disabled and not necessary -using WOT anyway.Lots of comments about folk having the prob if you do a Google search. Thanks Raymond for your articles. Thanks Raymond. But there is one thing you forgot. Its Rising AV(2011) doesn’t support Windows 8. And actually Avira full version can be used for free. They release 6 months/3 months license regularly. And Avira is the only AV that can be used with MSE efficiently without any conflicts. Please update the post. I really like Security Essentials as well. It just does its thing and you hardly know its even running. This product is a straight-up antivirus, not a feature-stuffed suite wannabe. Great, I’m grateful to receive your email notification about a new post. I have kept constant faith in your efforts and work. I always know you would send word about anything new. Anyway, as feedback to this article, I have continuously deployed complete Kingsoft Antivirus 2012 (Cheetah) real-time protection without any issues side-by-side along MS Security Essentials (+ TinyWall) on my Windows 7 x64 Pro desktop since last July. But that’s all I can say! A marginal day-to-day wage-earner, I haven’t gotten enough time to peruse other blog readers’ comments so far. I sincerely wish you all the best, man — being an audiophile freak and a proud Asian of partly Western and Sino-Malay descent, I’m very interested to hear about your music genre too! By the way, I’ll gladly extend any more help (in one of those little ways I can) when you really need it. Thanks for you post but I think a one week is not enough time for reliable test of so many products! I’am very satisfied user of free Comodo Internet Security product! I tested a lot of AV product and find NO ONE that is better than Comodo in protection and this is most important thing! Comodo is not for beginners in their strongest Proactive security configuration becouse Defence+ is actually a very strong HIPS modul who ask users interaction, however Comodo’s defoult configuration ( Internet Security) is good choice for beginners! Tip: when instaling, choose “custom installation” and then check/uncheck what you want! Good one Raymond, nice to see you back. Perhaps now you could do an up-date on firewalls which would then complete the overall picture? Thanks for your new Anti-Virus article. Always happy to receive your notifications in my email inbox. Does your new website format allow you to include among the pagination choices at the bottom of each part of the article, a choice for showing all parts in one, long page? Thanks. Hi, Raymond welcome back. I read the post and see that you have written very good. Morning from the East Coast of the United States of America! I Love MSE! I have it working alongside Malwarebytes Anti-Malware and the Comodo Stand-Alone Firewall to make up for what MSE lacks! These separate systems seem to work beautifully together! My second favorite Free Anti-Virus program in the whole-wide world is of course, Avast! I wake up each day checking my inbox for your knowledge and wisdom. And a question: as you mentioned, Ad-Aware Total Security uses G Data’s engine, but G Data uses Avast and BItdefender engine, so how this is working exactly? Hi, didn’t want to include Bitdefender Free edition because it is version 2009 which is really old and may not be that effective in today’s threat. That’s right. Ad-Aware Total Security uses G Data’s engine which is equivalent to Avast and Bitdefender. This would mean that Ad-Aware did not went through the trouble of integrating both of the antiviruses together and make sure they run properly without conflicts but rather depended on G Data to do it. Thanks for this article. Actually I had also planned to write a similar one in my site but that has delayed for long. Hey Sujay, thanks! Wasn’t really easy writing this as it took nearly the whole week because every antivirus had to be installed on my test system for a quick review. Thanks for the summaries, Raymond. I use both Avira (Win7, 64) and Avast (Win XP). I prefer the Avira, and the nag screens can easily be disabled. The only issue I have with Avast is if you do not enable all the add-ons, you get the warning sign in the sys-tray that your machine is not protected, which is not accurate. I simply do not need those components of the software on that machine. Used AVG years ago, but quit when it became, in my opinion, bloated and did not work well with my machines. I appreciate the list and will go through it more thoroughly this week-end and perhaps change things up a bit. Hi Raymond. I have enjoyed your blog for many years, learned much from them, and gotten free Pro versions of a few programs thanks to you (ie Advanced System Care Pro and Malwarebytes Pro). Nice to see your blog in my mailbox again after many months of absence. You should check out Qihoo 360. It have 5 engines and is super light. Detection and protection is on parr with Kaspersky. The downside is only available in Chinese. Most Chinese in Malaysia uses it. Another one is Roboscan. It uses Bitdefender engine. And is free. This post is split into 3 pages. Check out the pagination at the end of the post. Definitely not visible enough and we’ll look into improving it. Hai! Raymond, Happy to hear from you after long time dude, thank you very much for the post and it’s very very usefull, You Rocks Buddy!!!!!! Avast is one of the very few really antivirus programs that offer real-time protection for home PC security. Czech guys did a great job! AVG and Avira seem to be the only competitors. Finding a full-featured free antivirus is tough these days, most of the so-called “free” programs are either time-limited trials, or simply on-demand scanners without real-time monitoring. To my mind, avast! has the best interface of all free AV’s available for personal PC security. I don’t worry too much about risks like zero-day protection. The antivirus software and antispyware program that I run keeps about 98% of the garbage out of my computer and away from my home network. Most people run a multitude of different programs in order to remove threats and others to keep them out. Sadly the majority of these apps just don’t live up to their hype. You guys aught to check out the program I use. It’s currently available as a Free Antivirus download. I can’t tell you how convenient it is to have just one program that takes care of everything for me. Sigh…we should really define what “free” means…COMODO’s got it right. Your listings really helped me out! thank u very much, now i can complete my article about free antivirus . Comodo Antivirus is really very good. I can recommend it. I used Avast for years with great results. Ive been using Bitdefender for about 2 years now. Its my first all-in-one.